Home / Deals / Online Deals / Kindermint | Get Paid to Clean out Your Kids Closet! 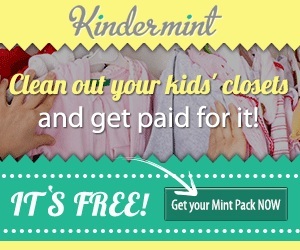 Kindermint | Get Paid to Clean out Your Kids Closet! *In order to reduce waste, we require a refundable deposit of $4.95. Cash in! Your choice of check or deposit to your PayPal account. Seems pretty easy and a great way to earn a little extra cash. So head over to Kindermint and check it out today! NOTE: When you return your Kindermint Pack you get your full deposit back so you aren’t paying anything out of pocket after you send your clothes in.